Long before “Green” or “Sustainable” became the powerful buzzwords they are today, Miriam Goldberger began growing wildflowers and fell madly in love with the beauty and practicality that native plants bring to our lives. 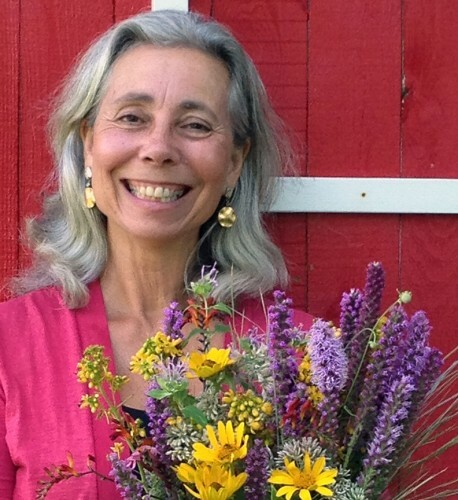 A flower farmer since 1986, Miriam has seeded, planted, nurtured, harvested and created floral designs with thousands upon thousands of wildflowers. As an expert in organic and sustainable gardening, Miriam is on intimate terms with the easy steps gardeners and flower lovers can take to create beautiful, diverse and sustainable landscapes. She is the founder and co-owner of Wildflower Farm, a wildflower seed production company in Ontario, Canada – a magical 100 acres where the wildflower gardens and meadows thrive without irrigation or pesticides and are a pollinators’ paradise. Miriam is truly a woman out standing in her field. Book Miriam for Your Event!